Had Larry Jordan's ' Editing Truths — for Better Living (Contest)' [http://www.larryjordan.biz/about/contest.html] at the back of my mind while editing with my director. We were doing our best to jazz up an otherwise humdrum video, using our arsenal of Digital Juice motion graphics packs. Since we've switched over from a 1GB Powerbook to a 4GB MacBook Pro for some of our editing, this is the first time we're really pushing the new Intel machine with multi layers of motion graphics and keyframing work. I guess we were expecting a sound barrier breakthrough in terms of speed - but alas, we still had to wait *gasp* for rendering! 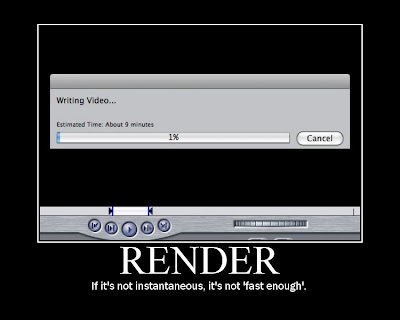 So, while twiddling thumbs with my director, staring at the rendering bar, I came up with the "If it's not instantaneous, it's not 'fast enough'" quip.